Two solid performers, the Ypsilon and Rockport combo was stunning. The word prodigious comes to mind recalling the prodigious nature of the Rockport Altair. The Altair struck me as monumental sounding, even though its cabinet appears sleek enough to disguise the fact that it is a hefty speaker. 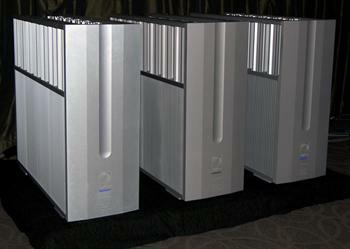 The trio of SET 100 amps were nearly the size of the Rockport speakers; well, ok, that’s a bit of exaggeration. Having spent some time with the Ypsilon CDT-100 player and the DAC-100 D/A converter I expected superb sound from these monstrous 120-Watt SET amps and I heard it.